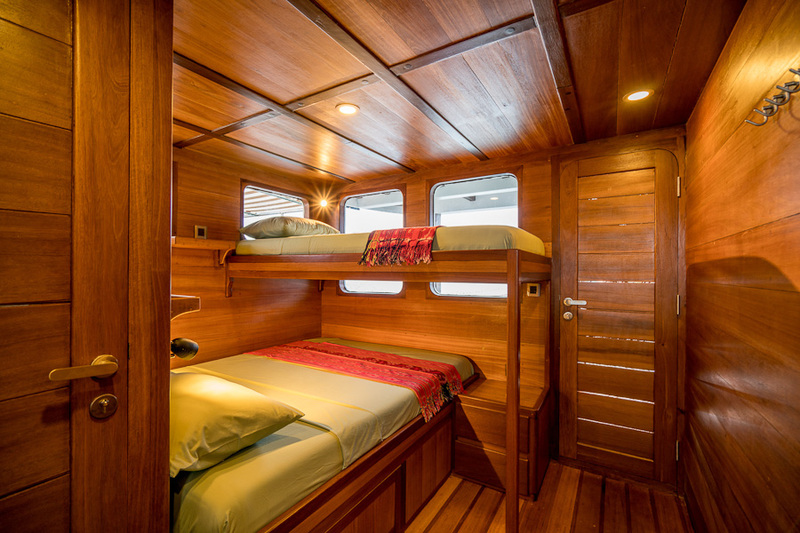 Oceanic liveaboard diving in Komodo and Flores - Book now ! 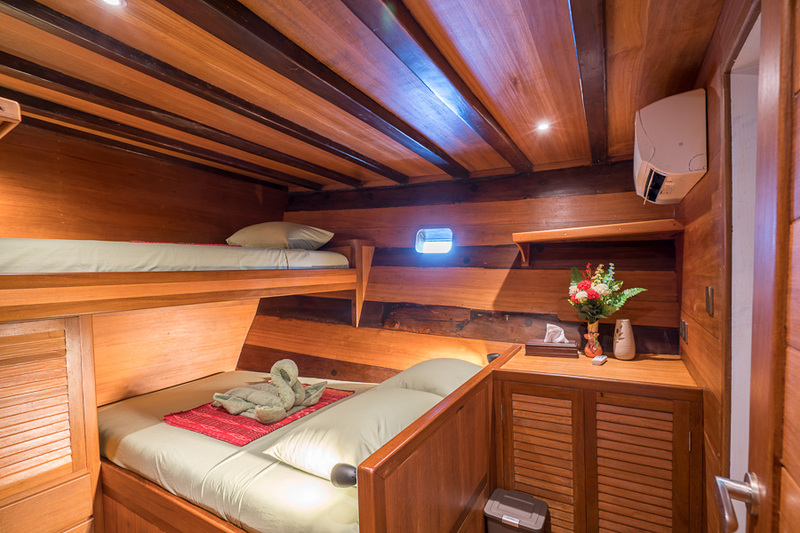 Fully renovated in 2016, MY Oceanic is the perfect boat to enjoy Indonesia's charming southern islands: Komodo, Bali, Flores, Alor and Forgotten. 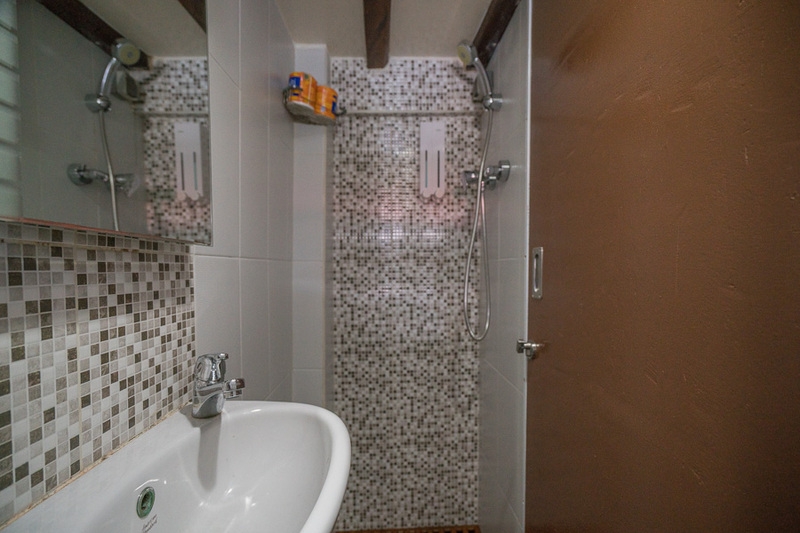 The 12 divers that she accommodates will enjoy the best amenities in a home-like environment while diving in the best diving areas in the region. 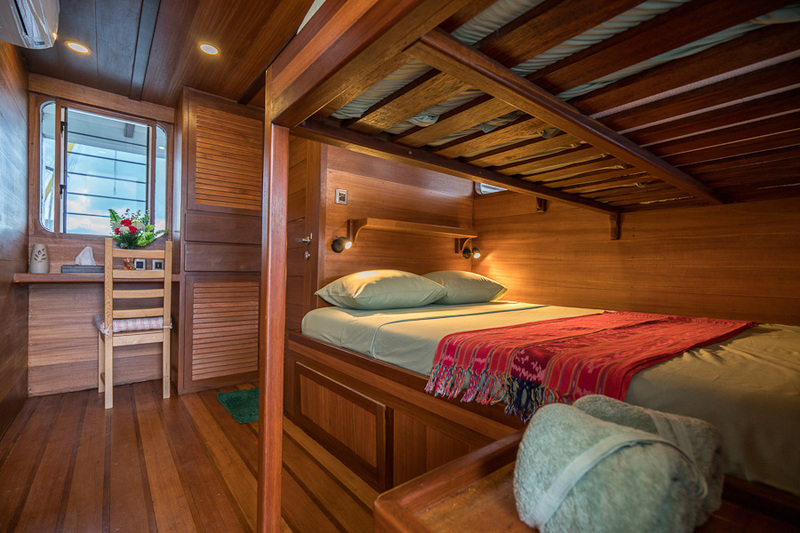 Upper deck suite: with sea views, desk, 150 cm double bed and bunk. 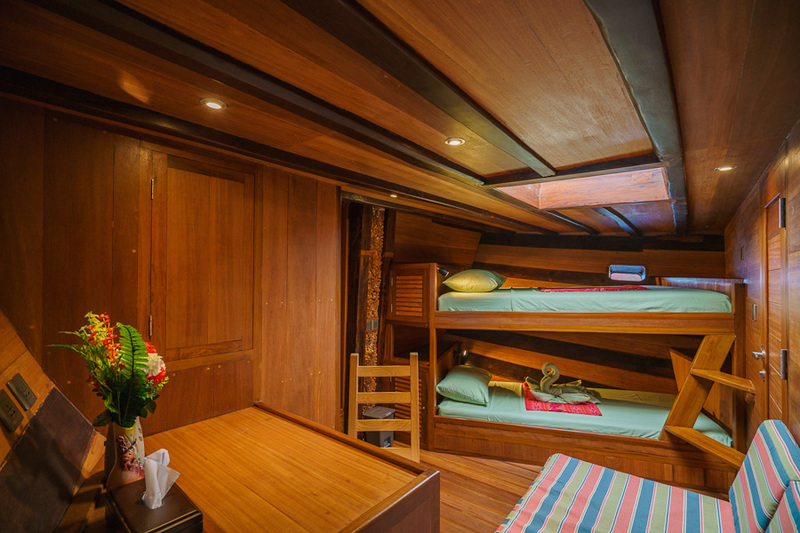 Lower deck suite: most spacious, with sofa, desk, 150 cm double bed and bunk and 4 standard cabins, with 140 cm bed and extra bunk. 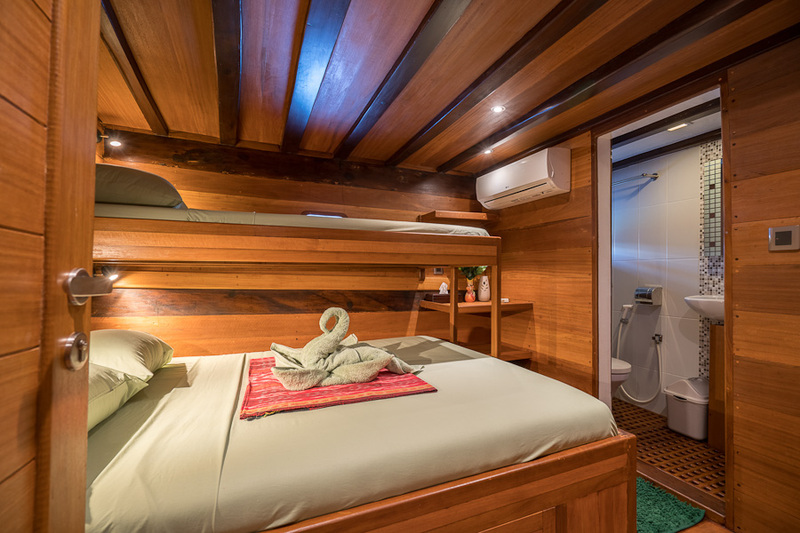 The cabins are distributed with 1 Upper deck suite: with sea views, desk, 150 cm double bed and bunk, 1 Lower deck suite which the most spacious, with sofa, desk, 150 cm double bed and 4 Standard bunk bed cabins on the lower deck, with 140 cm bed and extra bunk. Public areas include the lounge and dining area and outdoor lounge and sun decks. 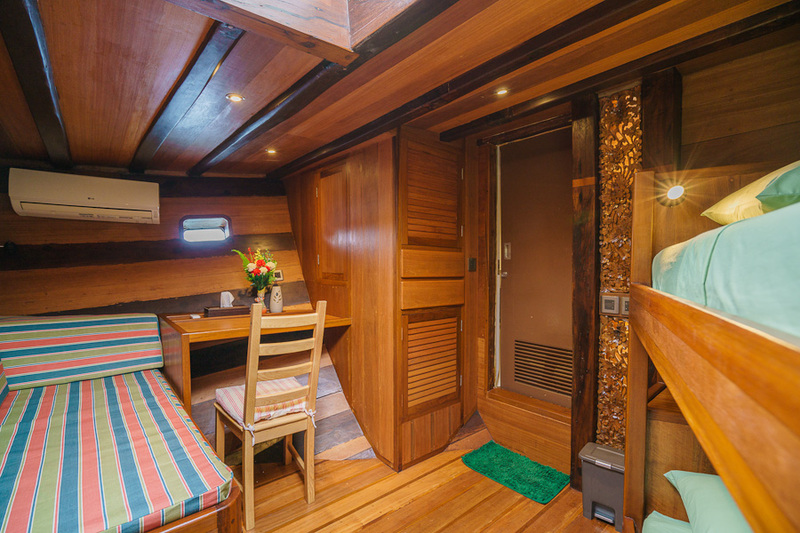 With her informal and relaxed ambience the Oceanic is a fantastic choice for your liveaboard in Indonesia. Collaboration with reefs protection and helping local communities. SMY Ondina will use part of her income to encourage and actively collaborate with all local organizations promoting Nature conservancy programmes and help for the local communities for improving their living standards. We will actively collaborate with other operators, local governments and nature conservancy organizations in all programmes arranged to meet these objectives. Same number of nights as number of days in the cruise, you disembark in the morning of the last published date. All transfers to / from airport or hotel to / from MY Oceanic in the town of embarkation/disembarkation are included. In the routes starting or ending in Bitung, transfers to / from Manado are also included. An average of 3 or 4 dives per day, all in day time or 2 or 3 day dives and 1 night dive unless weather conditions or long sailing distance do not permit it. First and Last Cruise days are excluded due to safety reasons and flight schedules. These dates we will dive accordingly. Any police or diving permit or touristic tax and harbour fees charged per passenger by any local authority, plus fuel increases. Please count on per trip 200€ per person for cruises starting or ending in Papua or Maluku and 100€ per person or 150€ per person for cruises in Komodo. This amount will be paid once onboard when requested by the Cruise Director. 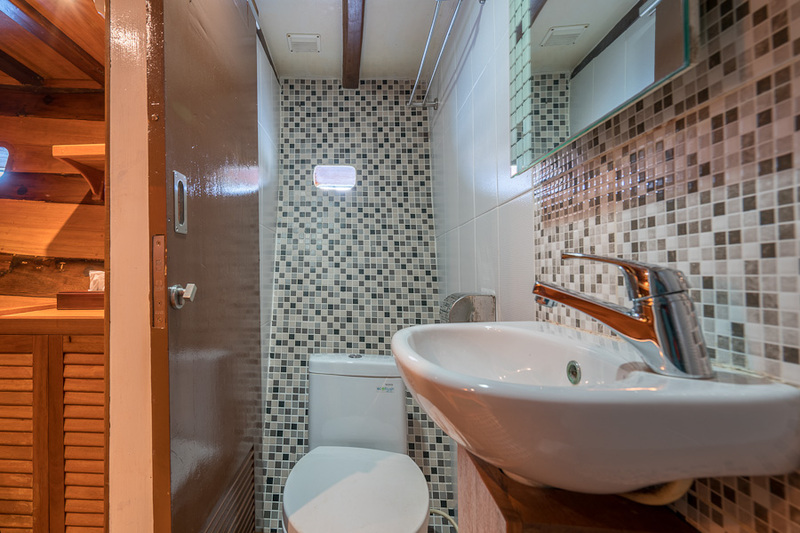 Travellers in a single cabin (not sharing) have a single supplement of 65% of the published price. A third passenger* in one cabin receives 25% off - Only applicable for a third non-diving passenger or child travelling with guardians, in triple cabins. Small groups of 6 divers have a special discount of 1 diver free of charge. All payments must be consolidated through only one person to enjoy the group discount. Oceanic has a limited quantity of SCUBAPRO equipment for rent so we strongly recommend you to inform us about your needs at the moment of the booking. 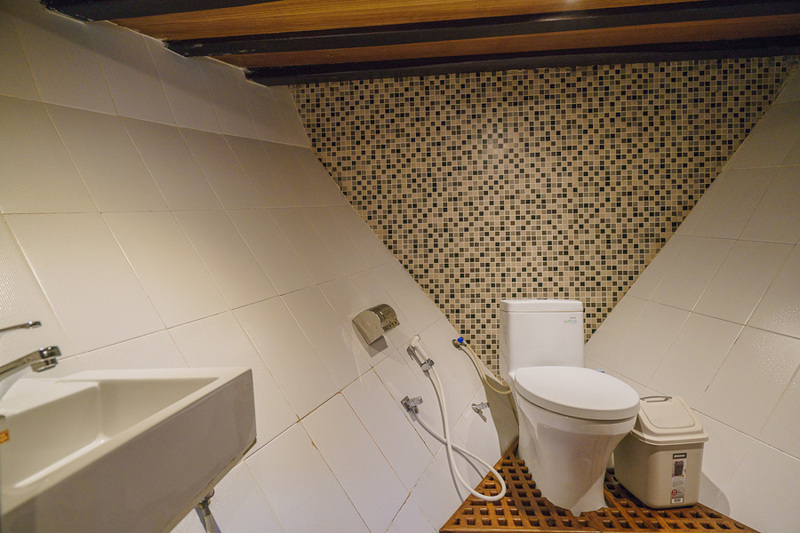 1 x Upper deck suite: with sea views, desk, 150 cm double bed and bunk. The Oceanic departs on the first date of the schedule after all the guests have been picked up and transferred to the boat from the airport or hotel. Depending on the flight schedule and origin, (Jakarta, Denpasar, Makassar, Manado…etc. ), the arrival time to the embarking port may vary and therefore there is no fix time for departure on the first date. ˇ All the guests must take flights arriving before midday (12:00) to the embarking port so that the cruise can start earlier and therefore we can dive more times on the first day. On the last scheduled date guests must leave the boat in the morning, latest 12:00, so that we can start the logistics to get the boat ready for the next cruise. The Oceanic “sleeps” in the disembarking port the night before disembarking therefore her guests can take the earliest flight out they want as we will arrange the transfer to the airport accordingly. The only thing to consider by our guests is that we follow the 24 hours safety stop (no diving before flying) therefore depending on their flight schedule on the disembarking date they will dive accordingly the day before. Itineraries are only orientative and might be modified due to weather conditions, sea conditions and other external causes. DAY 1: Transfer to the boat upon arrival in Bima, welcome drink and accommodation. Two dives in Bima bay: check dive in the afternoon in Bethlehem or Tanjung Batu Putih, plus night dive. DAY 2: Four dives in the volcanic island of Sangiang. Bubble Reef (a beautiful coral garden at the foothills of a volcano, with bubbles of the underwater vents emerging from the black sand), and critter diving in black sand in Critter Creek, Pohon Merah and Bontoh. DAY 4: Three day dives in the Straits between Komodo and Rinca. Manta site in Karang Makassar and the spectacular sites of Batu Bolong (a pinnacle rising from the depths and concentrating large amounts of sealife) and Tatawa Islands. Night dive in Pulau Sebayor. DAY 5: Early morning walk to the Komodo National Park, followed by dives in Pulau Tengah and night dive in Siaba Kecil. DAY 6: Last day-dives in the straits. Navigation to Labuhanbajo for departure the following morning. DAY 1: Transfer to the boat upon arrival in Labuhanbajo, welcome drink and accommodation. Dive in the underwater mountain in Pulau Sabolan and a critter dive in Pulau Bidadari near Labuanbajo. Afternoon dives in Horseshoe Reef and night dive in Pulau Sebayor. DAY 2: Dive around Pulau Padar, in famous submerged ridges of Three Sisters, Secret Garden or Pilarsteen. Night dive at Evening Star, a mini-wall covered with invertebrate life. DAY 3: Four dives in Nusa Kode, on world famous sites such as Cannibal Rock, an underwater mountain literally coated in marine life and invertebrates, and Yellow Wall, Boulders… Night dive in Torpedo Bay. DAY 5: Two dives in the morning, usually repeating star sites such as Batu Bolong or Castle Rock, or alternatively can do different sites like Pulau Hantu and Pantai Merah. Sail back to Bima to fly the morning after. DAY 2: Three day dives in the Straits between Komodo and Rinca. Manta site in Karang Makassar and the spectacular sites of Batu Bolong (a pinnacle rising from the depths and concentrating large amounts of sealife) and Tatawa Islands. Night dive in Siaba Kecil. DAY 3: Early morning walk to the Komodo National Park, followed by dives in Pulau Tengah and the famous submerged ridges of Three Sisters. Night dive at Evening Star, a mini-wall covered with invertebrate life. DAY 4: Four dives in Nusa Kode, on world famous sites such as Cannibal Rock, an underwater mountain literally coated in marine life and invertebrates, and Yellow Wall, Boulders… Night dive in Torpedo Bay. DAY 6: Two dives around the straits of Komodo and afternoon dive in the underwater mountain in Sabolan Kecil. Overnight sail to Pulau Paloe. DAY 7: Two wall dives in Pulau Paloe. Afternoon visit to the traditional village on the foothills of the volcano. Night dive in the bay. DAY 8: First dive in Pangabatang, a sandy alley with richly covered boulders. Second dive in Pulau Babi, on the massive crack on the reef caused by the earthquake in 1992. Afternoon visit to Ankermi resort to drink traditional Flores coffee and local palm wine, before sailing back to Maumere to fly the morning after. DAY 6: Three day-dives in the straits and night dive in Pulau Wainilu. DAY 7: Dive in the underwater mountain in Pulau Sabolan and a critter dive in Pulau Bidadari near Labuanbajo. Afternoon dives in Horseshoe Reef and night dive in Pulau Sebayor. DAY 8: Dive around Pulau Padar, in famous submerged ridges of Three Sisters, Secret Garden or Pilarsteen. Night dive at Evening Star, a mini-wall covered with invertebrate life. DAY 9: Four dives in Nusa Kode, on world famous sites such as Cannibal Rock, an underwater mountain literally coated in marine life and invertebrates, and Yellow Wall, Boulders… Night dive in Torpedo Bay. DAY 11: Two dives in the morning, usually repeating star sites such as Batu Bolong or Castle Rock, or alternatively can do different sites like Pulau Hantu and Pantai Merah. Sail back to Bima to fly the morning after. Day 1: Transfer to the boat upon arrival, welcome drink and accommodation. Check dive in the jetties of Maumere, with multiple critters including ribbon eel, ghost pipefish and frogfish, and a small wreck of a sailing boat. Night dive in Maragajong, a wall SW of Pulau Besar. Day 2: First dive in Tanjung Gedong, along a wall with a couple of pinnacles rising from it, sporting reef sharks, tuna, barracuda and schools of fish. Second dive in West Serbete, a ridge covered in hard corals with schooling silvery fish and sharks. Third dive in Watu Peni, a drift dive along a wall with turtles, eagleray and napoleon wrasse. Night dive inside a nearby bay. Day 3: Morning visit to the village of Lamakera, dedicated to traditional whaling and manta hunting, but currently undergoing a sponsored program to become a conservation center to study manta populations. After breakfast dive Pulau Soangi, featuring terraces covered in soft corals, caves, canyons and a swim-through across the island, or if weather doesn’t allow it, dive Tanjung Lowokuma instead, a slope with scattered coral heads, fans, sponges and glassfish, schools of fish and critters. Afternoon dive and night dive in The Brewery, an excellent muck site in West Lembata. Day 4: Dive West Pantar, in current swept sites such as Pulau Kambing, a small inlet featuring a big boulder with an arch and schools of fish, a pinnacle with a sprouting little ridge that attracts a lot of fish life, and Watu Ile, a small wall with a swim-through at 26 m. Night dive at a nearby reef. Day 5: Dive the Straits of Alor, in Cave Point, a wall with many pockets an islets, Babylon, hanging gardens of soft corals, sponges and fans, and Kal’s Dream, a ridge exposed to currents that offer some adrenaline diving and pelagic fauna. Night dive in front of a fresh water creek at Pancoran. Day 6: First dive at The Great Wall of Pantar; second dive at Tanjung Elalara, a slope that turns into a wall, with good coral coverage, schools of fish and the od snake, morays or mantis shrimp. Afternoon and night dives at Beang Abang, a critter dive in a small beach with hot springs, where ribbon eels, frogfish and even Rhinopias can be found. Day 7: First dive at Clownfish Valley, probably the largest anemone field in the world. After breakfast visit a village to witness traditional Ikat weaving. Second dive at The Boardroom, a slope covered in hard and soft corals, with lots of fish and eaglerays swimming in the blue. Afternoon dive in The Cathedral (current allowed), and night dive inside Kalabahi Bay. Day 8: Dive inside Kalabahi Bay, first dive in Mucky Mosque, a slope covered in corals with sights of octopus, leaf fish, mantis shrimp and morays, and second (and last) dive in the Pertamina Jetties, an excellent muck site with ghost pipefish, seahorse, frogfish, mandarin fish… Arrive Kalabahi in the afternoon and preparation to fly the morning after. Navigation equipment: Simrad Radar, Garmin GPS-Plotter Navionics, VHF and SSB radio. What shall I take with me to a SMY Oceanic Cruise? Most Important: Check your visa Requirements. Since February 2004, Indonesia has changed the Visa requirements for many countries. Some nationalities can get their visa on arrival, some others must bring the visa issued by an Indonesian Embassy. On August 2005 Visa-On Arrival was extended from 21 countries to 35 countries - cost for these visas are US$10 for a stay of up to 7 days, US$25 for a stay of up to 30 days. On top of that you passport must be valid for a minimum period of 6 months …..don’t forget to check!! Your diving equipment and all spare parts you may need. We have limited number of equipments for rent and plenty of spare parts onboard but only for SCUBAPRO gear. Photography equipment, memory cards for your digital camera, although you may empty them on a CD with the rewriter onboard. Mosquito repelent, just in case we need it in any land excursion (never on board) Any specific medicine you may be taking (No need for Malaria treatment unless you are extending your stay in a malaria endemic area!). We have a complete First Aid Kit on board for light accidents. Light and comfortable clothing (shorts & Tshirts) and any kind of shoes you can soak for coming in and out of the dinghies when going ashore. Your favourite alcoholic drink from the Duty Free shop at the airport. We only have softdrinks and beer onboard. They are usually very strict with overweight when checking for the domestic flights. You may have to pay a variable fee per kilo if you exceed the 20Kg allowed, so bring the minimum with you. The average water temperature is around 28ºC but in some areas, like S. Komodo, the temperature can drop to 23-24ºC. Normally a 3 or 5 mm wetsuit will be sufficient. Why only 3 dives per day? SMY Oceanic sails an average of 200-300 miles in every charter (except for the Exploratory ones where we sail a longer distance) to take you to the best diving places, this forces us to sail from 2 to 4 nights every cruise. We normally go ashore 2 or 3 times during an 8 days cruise to visit spectacular places in our popular land excursions. These days we can only dive 3 times. Moreover, in such a long cruise, with so many dives and having to fly the same day when disembarking or the day after, it is not convenient at all to saturate so much for safety reasons. Embarking and disembarking days we can only dive 2 times. The rest of the days we normally dive 4 times unless weather conditions or any unexpected. Are all dives Drift Dives? This is the black story about diving in Indonesia. The country is too big to generalize and our routes cover a very big area. Most important, our Dive Masters knowing the divers’ skills and interests in every cruise, specially when there are uw photographers onboard, will plan the most suitable dives to satisfy the whole group. In every route you will find drift dives, a maximum of 50%, but only 10%-15% will be with strong currents and in these cases, don’t worry because our dinghies crew are prepared for them.You will also enjoy shallow dives, muckdiving, seagrass meadows, coral gardens, walls and hangouts….diversity guaranteed. What, where and when about money to bring. € os and Dollars are widely accepted in Indonesia. You only have to be cautious with making sure you bring brand new or clean paper money, not a single scratch or ink mark, or you will have problems to have them accepted. The best exchange rates are in Bali but take care with some “money changers”, count your change twice before leaving the shop. In the boat we accept cash in rupiahs, € os and dollars, (sorry no credit cards yet) and apart from that you will only need some small money for handicrafts when visiting some villages….rupiah reccomended for this!